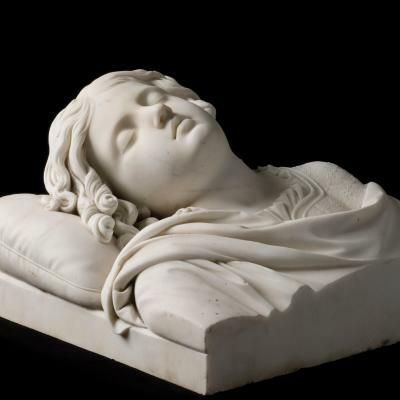 Thomas Ball, Boston sculptor, was one of more than one hundred expatriate artists living in Italy in the nineteenth century. He worked in the realistic style and was most successful in marble sculpture and heroic bronze statues, but was also accomplished as a portrait painter and musician. His best-known monuments are the equestrian George Washington in the Boston Public Garden, the heroic Daniel Webster in New York's Central Park, and the Lincoln Emancipation Group in Boston and Washington, D.C.
Born in Charleston, Massachusetts, June 3, 1819, Thomas was the son of a house and sign painter and the youngest of five children—four of them girls. From Ball's earliest years he felt drawn to music and art. He carved miniature models of ships viewed from the wharfs, which encouraged him to seek work briefly as an apprentice to wood engraver Abel Bowen. Ball was forced to quit the Mayhew School at an early age to help support his family upon his father's death. He worked at Moses Kimball's Boston Museum and Fine Arts Gallery, performing assorted tasks including the repair of wax figures and conducting tours. Ball occupied his spare time reproducing the paintings on display, and supplemented his salary by cutting profile silhouettes for the patrons. These were so successful that he set up a small attic studio in Boston in 1837 and began painting miniature portraits, eventually graduating to life-size portraits and paintings of religious and historical subjects. These included such ambitious paintings as Christ in the Temple with Doctors and Scene From King Lear. Several of Ball's works were exhibited in the 1840s at the Boston Athenaeum, the American Art Union, and the Apollo Art Association. Ball's first sculpture came about after an unhappy love affair. He could not concentrate on painting, and, in an attempt to distract himself from his thoughts, he began to model clay heads, at the suggestion of his friend the sculptor John C. King. These became very successful, and Ball's career as a sculptor was launched. After executing cabinet busts, principally of musicians (among them George J. Webb, George F. Hayter, and Charles C. Perkins), he modeled a life-size portrait bust of Daniel Webster, completed just after Webster's death, which gained him much recognition. It was constructed chiefly from memory, since the Statesman never sat for him, and depicted a convincing resemblance of Webster's features and personality. Webster held a special attraction to Ball, who had admired him since boyhood. The sculptor then executed a small statuette, hoping to win a commission for a life-size statue. 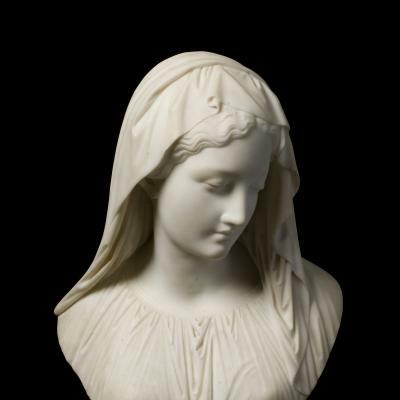 Although not selected, the model was mass-produced in plaster and bronze and sold to the mourning public in 1853. The orator and statesman is depicted as if prepared to address Congress, standing erect, his right hand tucked in his jacket in Napoleonic fashion. Many years later, this statuette was enlarged to heroic proportions and placed in New York's Central Park. Ball later modeled a companion study of statesman Henry Clay, 1858, and the two statues formed a complementary pair, with the wiry figure of Clay balanced by the ample-bodied Webster. The success of these helped establish a business of small plaster statuettes and portrait studies. 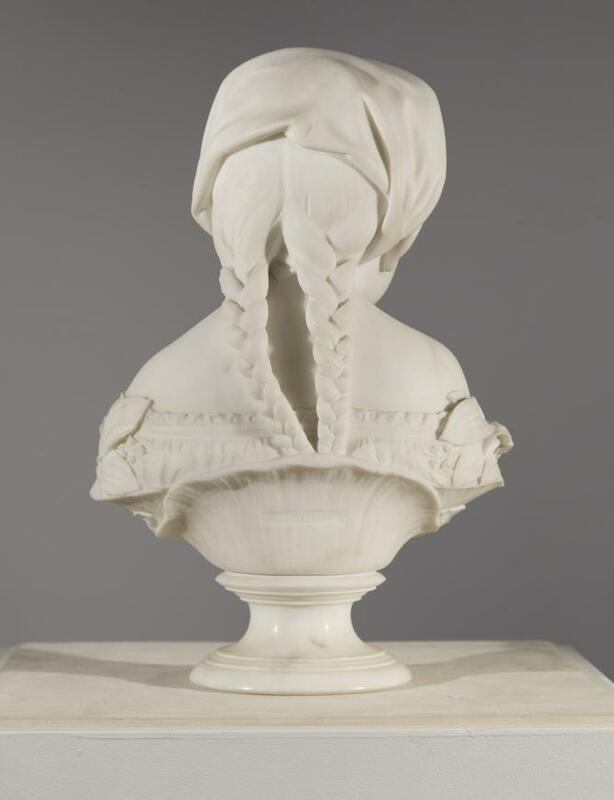 At age 35, with growing success in the sculpture profession, Ball married Ellen Louisa Wild and set sail for Italy in October 1854, aboard the steamer America, intent upon studying and working with the artists in Florence. Although late in establishing his profession, he expanded his reputation and became a close friend of the sculptors Hiram Powers and Joel T. Hart. Among their colleagues were the painter-poet Thomas B. Read, the painter Francis Alexander, and the poets Browning. The expatriates formed a very close social circle and often held receptions where the conversation was interspersed with music and an occasional recitative or theater production, and with refreshments of tea and cakes. Ball returned to Boston in 1857 and gained the award to build an equestrian statue of George Washington for the city after the untimely death of Thomas Crawford, who had originally been granted the project. He spent four years (1860-64) laboring over this model and the statue was placed in the Boston Public Garden. It drew critical comparisons to the fifteenth-century work of Verrocchio in Venice. After the statue was completed, Ball returned to Florence in 1865, building his villa there in 1870. In Italy, Ball's career flourished, and he received numerous orders for portrait busts, heroic bronze monuments, allegorical works, and cemetery memorials. For the city of Boston he executed statues of Charles Sumner, Josiah Quincy, and John A. Andrew, 1870. Although not a high school graduate, he received an honorary Master of Fine Arts degree from Dartmouth College in recognition of a series of portraits he had executed of illustrious alumni and administrators, including Daniel Webster, Rufus Choate, William H. S. Smith, and President Nathan Lord. 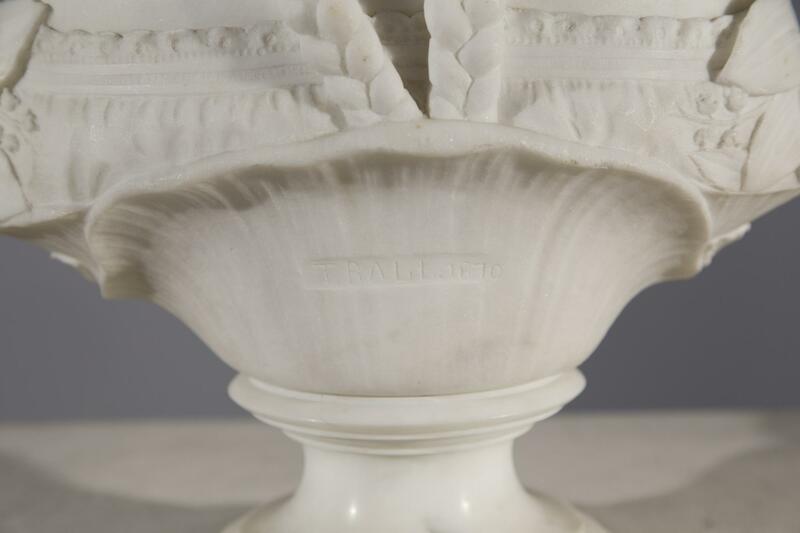 Ball remained in Florence until 1897, when he returned to America and set up a studio in New York City with his son-in-law, the sculptor William Couper. Despite his long sojourn in Italy, his art remained fundamentally American in style. Ball and Couper worked together on the seated statue of Longfellow, placed in Washington, D.C., 1909. In all, Ball was a self-made man who rose from obscurity to prominence in his profession. Never formally retired from sculpture, in his last years he dabbled in his lifetime hobbies of music composition, writing rhymes and painting until his death in 1911, at his home in Montclair, New Jersey. Ball felt a special force planning the pattern of his life. He noted in his first autobiography that he "had a firm belief in the influence of good and bad spirits, though not the slightest in their visible, audible, or tangible manifestation." This influenced him greatly, and he stated the temptations and frustrations in life “may be met and conquered by a firm determination without compromise, but with faith in the assistance of a higher power.” In glancing at the life of Thomas Ball, the first thing which impresses us, and the last, is his sterling honesty. It is a pure, consistent, brave life from beginning to end. According to Ball’s autobiography, he modeled La Petite Pensée soon after creating his full-length statue Eve Stepping into Life (1867). During this period the affluent sculptor also constructed a villa on the Poggio Imperiale near that of his friend Hiram Powers and began his Governor John Albion Andrew (1870) for the Massachusetts State House in Boston. 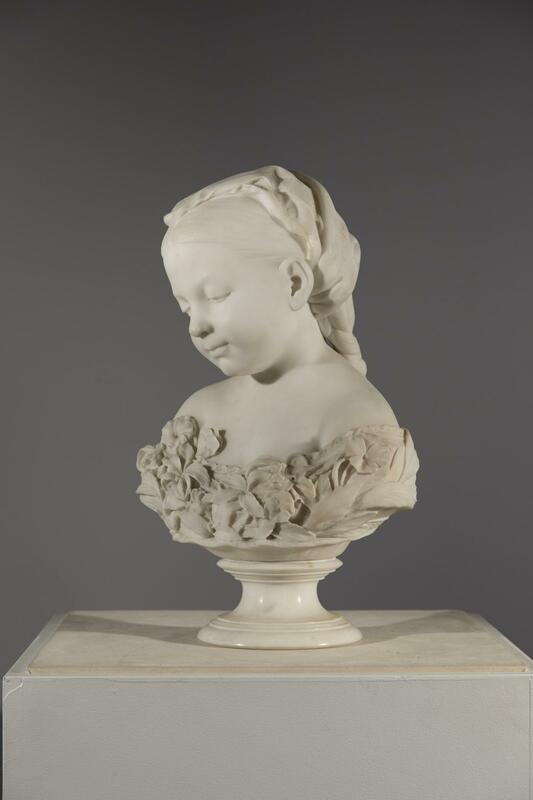 Of this bust, Ball said only, “Here [in Florence] I next modelled the little head ‘La Petite Pensée,’ which has had such a wonderful success.” The portrait has been thought to show the features of his daughter, Eliza “Kitty” Chickering Ball, but the sitter looks younger than eleven, which Kitty would have been in 1868. 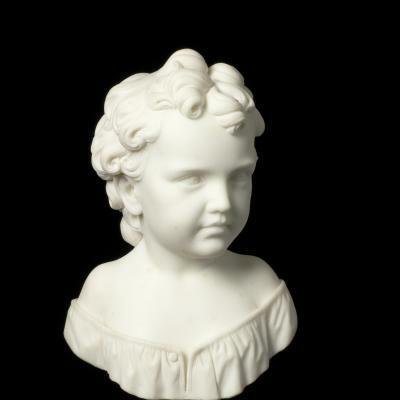 Ball scholar and descendant Greta Couper has observed that there is not a strong physical resemblance between Kitty and the subject of the bust and that Ball used the children of his Italian adult models as subjects. Another scholar has proposed that the model was Ball’s niece Annie Chickering, who lived with the Balls in Italy for five years and who would have been about seven in 1868. 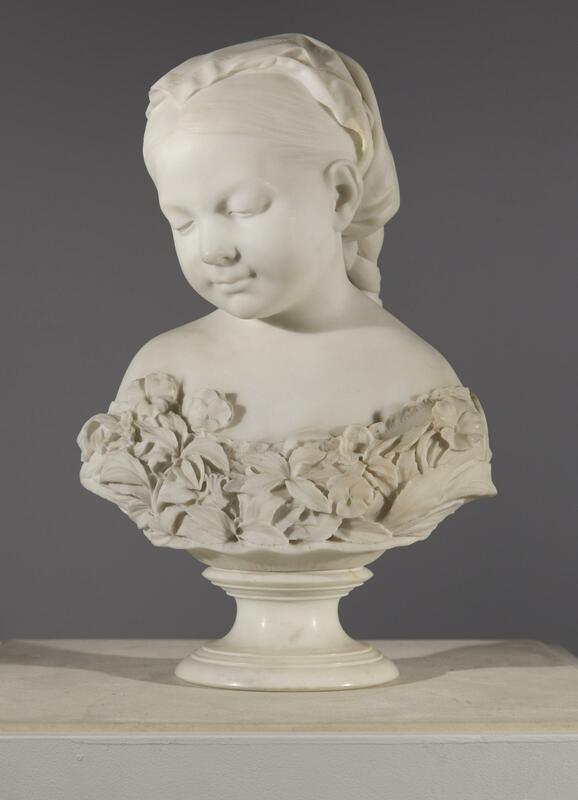 Images of children were first popularized in nineteenth-century American sculpture by Horatio Greenough and Thomas Crawford and continued by second-generation expatriate American sculptors, particularly Ball, William Henry Rinehart, and Randolph Rogers. Ball’s works in the genre include Christmas Morning (1872)and Saint Valentine’s Day (1874). 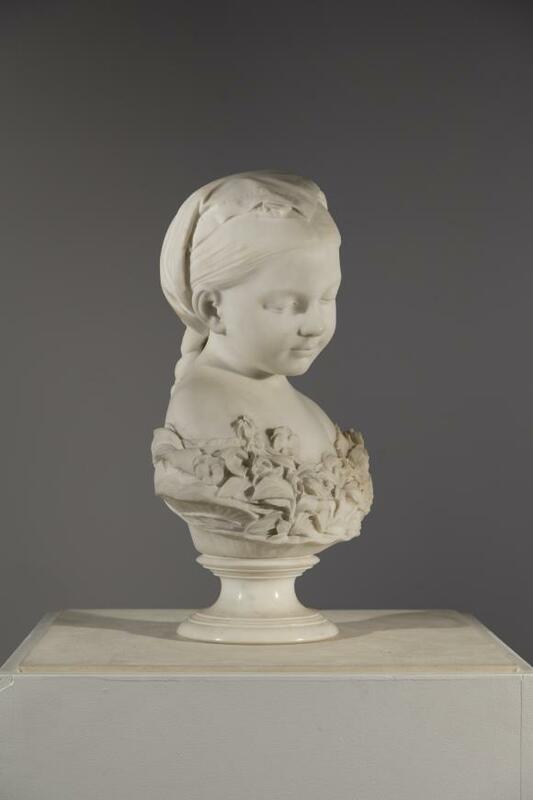 Sunshine (1872) is an ideal bust of a young girl—in this case probably Kitty Ball—which closely relates to La Petite Pensée in theme and composition. The posture of Ball’s youthful thinker is slightly coquettish, with her right shoulder thrust forward, in contrast to her demure, downward glance. Her off-the-shoulder dress is trimmed with eyelet and overlaid with a wreath of stylized leaves entwined with pansies, a symbol of the Trinity. Furthermore, in Victorian flower language, pansy was the anglicized spelling of the French pensée, or thoughtful recollection, and in Shakespeare’s Hamlet (4.5.175-77): “there is pansies, that’s for thoughts.” The girl’s long hair is partedint he center and braided at the back. A kerchief with a hemstitched border covers her head and gives her an air of saintliness. Her countenance has a simplicity and purity reminiscent of Renaissance images of children by Desiderio da Settignano that Ball would have seen in Florence. 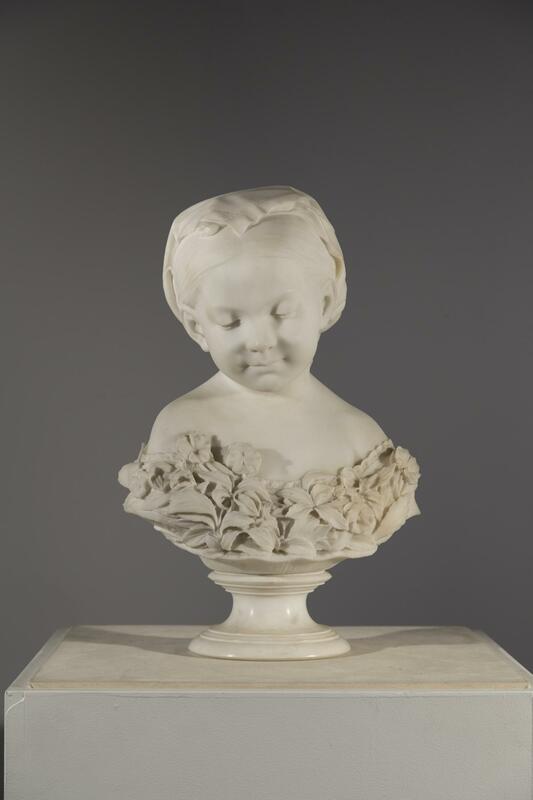 The earliest known marble La Petite Pensée is dated 1868 (private collection); the Metropolitan’s was carved the following year. Additional replicas in public collections are located at the Allentown Art Museum, Allentown, Pennsylvania (1875); the West Roxbury branch of the Boston Public Library (undated); Indiana University Art Museum, Bloomington (1870); Munson-Williams-Proctor Institute Museum of Art, Utica, New York (1876); and the National Museum of American Art, Washington, D.C. (undated).